"No matter what you're grilling this summer, chances are good you're going to have more hot coals than food to cook on it, which makes baba ghanoush the perfect post-barbecue recipe. This is a wonderfully savory yet refreshing vegetable dip." 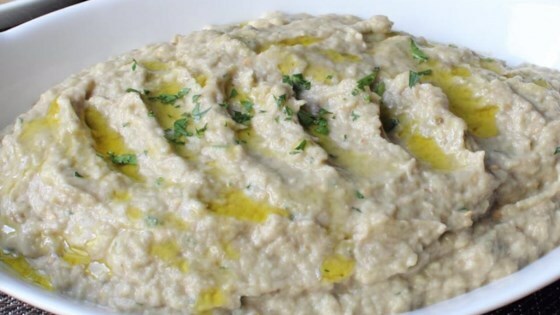 Baba Ghanoush is a delicious vegetable spread using freshly grilled eggplants. You can cook the eggplant any way you want, but charcoal is my favorite. Next best would be cooked over a gas burner, but that can really mess up your stove, so I guess the real next best is baked at 400 F. until they collapse, and get very soft. Wow! So good. I cut the eggplant in half lenthwise and baked them on a cookie sheet at 450 for about 25-30 minutes. Then followed the recipe from there. Delicious!